Interlock Edging & Restraint For Sale in Dundas, Ontario - Legends Landscape Supply Inc.
You want your patio, walkway or interlocking landscape feature to last. What you don’t want is to watch your hard work degrade over time, requiring you to sink hours of repair time into it down the road. Using a quality interlock edging will help keep your workmanship looking flawless over time. Remember to plan for 6 inches of extra compacted base material beyond the footprint of your patio. This area is important to receive the 10 inch spikes that hold the edging in place. 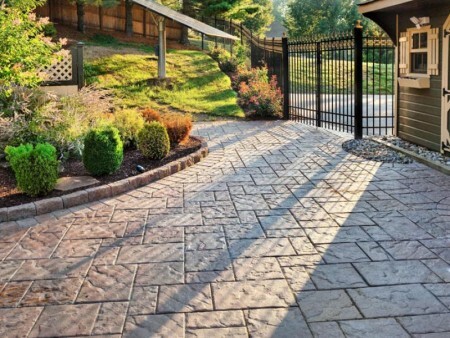 Without utilizing our aluminum or plastic edge restraints, pavers will shift due to traffic and seasonal changes, and the base they have been laid on will start to erode. You’ll be left with an uneven, unsightly brick or stone feature. It is very important to use paver edging along any area such as gardens and grass that can contaminate your base material in the future. Secure your restraints with spikes every few feet (closer together in curved areas). We are pleased to provide you with everything you need for the complete job. Our restraints are available in grey aluminum and black plastic for the most discrete installation, and they are designed to sit subsurface. Get the superior interlock restraint for quality, long lasting workmanship. Visit us today for assistance selecting the right size and quantity.